Synthetic peptide within Human Actin aa 1-100 (N terminal). The exact sequence is proprietary. Our Abpromise guarantee covers the use of ab15263 in the following tested applications. WB Use at an assay dependent concentration. 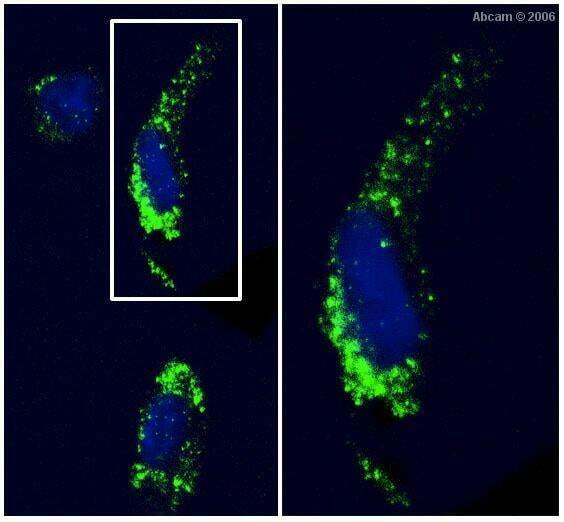 Detects a band of approximately 42 kDa (predicted molecular weight: 42 kDa). Incubate for 10 min at RT. 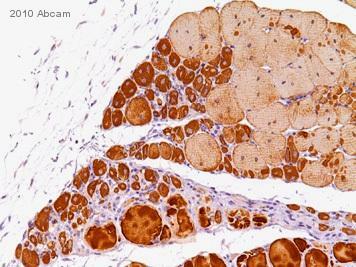 No special pretreatment is required for the immunohistochemical staining of formalin/paraffin tissues. Immunohistochemical analysis of Human skeletal muscle, staining Actin with ab15263. Publishing research using ab15263? Please let us know so that we can cite the reference in this datasheet.